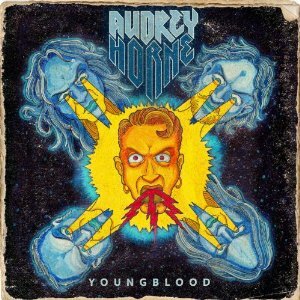 Share the post "AUDREY HORNE – Youngblood"
Audrey Horne are amazingly on their fourth album and feature members of Enslaved and Sahg, although Audrey Horne owe more to 70′s hard rock and modern rock. I had heard the name before but had not heard much by them and that is my loss. They pen such instant, yet remarkably heavy tunes like the title track. I defy anyone not to be singing the chorus after one play! Although no keyboards player is in the band’s line-up they do add some nice touches like the organ and (I think) synth on ‘Show And Tell’. ‘Cards With The Devil’ is another song with subtle keyboard flourishes and again it has a massive, riff filled chorus. For a real piece of 70′s blues hard rock look no further than ‘Redemption Blues’ where they rock out big time. ‘Pretty Little Sunshine’ reminded me of Thin Lizzy on the guitar solos, whilst ‘The Open Sea’ blows the Answer out of the water. Fancy a decent pirate themed romp? Then crank up ‘This Ends Here’, again a little bit of Thin Lizzy on the chiming guitar solos and the lyrics are great fun. Along with the title track one of the best songs on the album. Perfect for the next ‘Pirates of the Caribbean’ soundtrack. There are a lot of bands out there now claiming to have been inspired by 70′s rock and many are being signed up by labels better known for more metal related bands, but they will all have to go some to beat this band. It is hard to put your finger on it exactly but they have that special musical magic to set them way ahead of the competition. Simple really, go buy this album as you won’t be disappointed. This entry was posted in ALBUM REVIEWS, All Posts and tagged AUDREY HORNE, Enslaved, Youngblood. Bookmark the permalink.